Mark Williams recruited two experts who have spent years re-enacting the lives of General Isaac Brock and Chief Tecumseh, who were pivotal in the War of 1812. Mark Williams can finally sit back and take in the life-size statue of Chief Tecumseh in his garage art studio. Standing almost three metres high, there is plenty of detail to look at with the statue carved out of clay and Styrofoam over the past six months. Williams now has the delicate task of cutting the statue into pieces so it can be sent off to be bronzed. This is the second statue the Amherstburg, Ont., artist has completed for a commemoration of the War of 1812, or more specifically the Battle of Fort Detroit, which started when British and Aboriginal fighters crossed the river from what is now Windsor's west-end neighbourhood of Sandwich. He already created a statue of General Isaac Brock, which is nearly bronzed and ready to be welded back together for next year's unveiling. Williams cherishes people's reactions when they first see Tecumseh. Seeing it leave, though, will be a challenge. "You finally get to the stage where you can look at it for a few hours and now it's got to leave," he said. Before even picking up a single tool, Williams recruited two men who have spent years re-enacting the lives of Brock and Tecumseh. 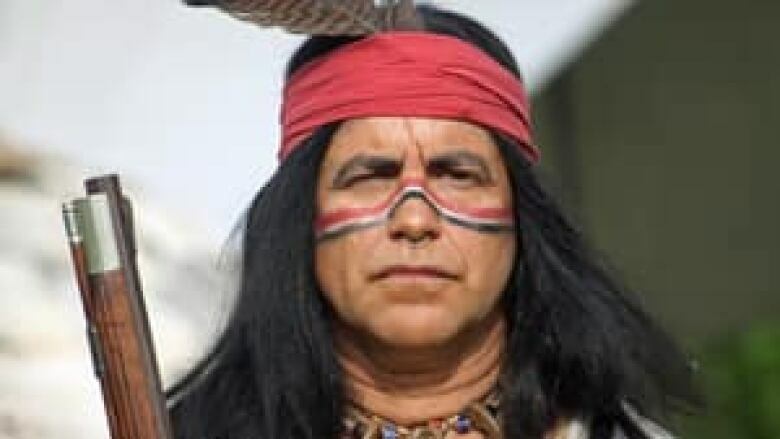 David Morris has long portrayed Chief Tecumseh in re-enactments, while Scott Finlay has spent plenty of time filling the tall boots of General Brock. Williams then drove both men to a horse farm to get inspiration for the animal Tecumseh would end up sitting on for the statue. Williams got more than he expected from that trip. Morris and Finlay rarely break character when they suit up in their costumes. The two men bickered in the back seat of Williams's car, talking about how each one of them could have done things better during the Battle of Fort Detroit. "They were arguing about who did what and when," Williams said. "It was just hilarious." The statues will stand next to each other when they are returned to Windsor. The original plan was to unveil them at Patterson Park on Canada Day, but those plans have changed slightly. John Muir, the man who spearheaded the project back in 2012 on the 200th anniversary of the War of 1812, said the city will wait until September of 2017, instead of sharing in Canada's 150th birthday celebrations earlier in the year. "That way, we'll have a whole day to ourselves for this important project," he said. Muir is the former principal at General Brock Public School, where he used to envision having a statue that marked the important battle in Canadian history. "Here we have two heroes of Canada — A First Nations chief and a British general, who came together," he said. "And because of them, capturing Fort Detroit, they stopped what Thomas Jefferson said would be a mere matter of marching into Canada."